Is your city or tournament on the board? 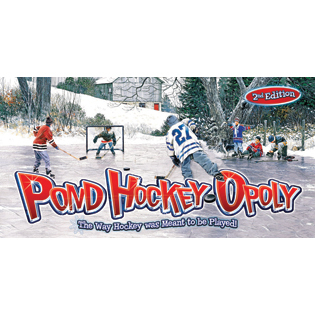 The whistle blows and... the Canadian and US Pond Hockey teams battle the pressure as they FACE OFF in the Pond Hockey-Opoly, 2nd Edition! Featuring 80% new content with a split of 50/50 Canadian and US properties, this game is sure to keep the outdoor air alive. Be sure to check out the video! Make a fast break to score Sparrow Lake property, in Orillia, ON and find out how much money the Taylor Cup Pond Hockey Tournament raised for The Princess Margaret Cancer Research Fund! Or, which former NHLer lives near Dover, New Hampshire, home of the Stimilon Pond Hockey Challenge! The back of each property card is rich with fun facts for your favourite pond hockey tournaments. Where can I buy this board game? Click here for our Retailer Locator Form.